My mom had the best Holiday decorations and took pride in her presentation of them. She's given me some great memories and a hard act to follow, and yes I'm thankful for it. Just after the fun of Halloween and right before the rush of Christmas, falls Thanksgiving, the time of year where we’re supposed to reflect on our lives and give thanks. In recent years, thanks to social media, some have decided to be thankful all month long, recording the everyday nuances we sometimes take for granted to celebrate the little moments in life. But why do we need to wait for a holiday to recognize what we should be thankful for? Would it make our thanks any less genuine if we noticed them every single day? Really? We’re that busy with our lives? Don’t get me wrong; the fact that we take this time to be thankful at all is a great thing. I’m not discounting all the good that it brings to each of us; I’m just wondering why it’s so hard to do this daily. For just a moment, a tiny slice out of your day, look at your life or situation and find a positive to be grateful for and I promise you it will make you feel good, maybe even inspired. 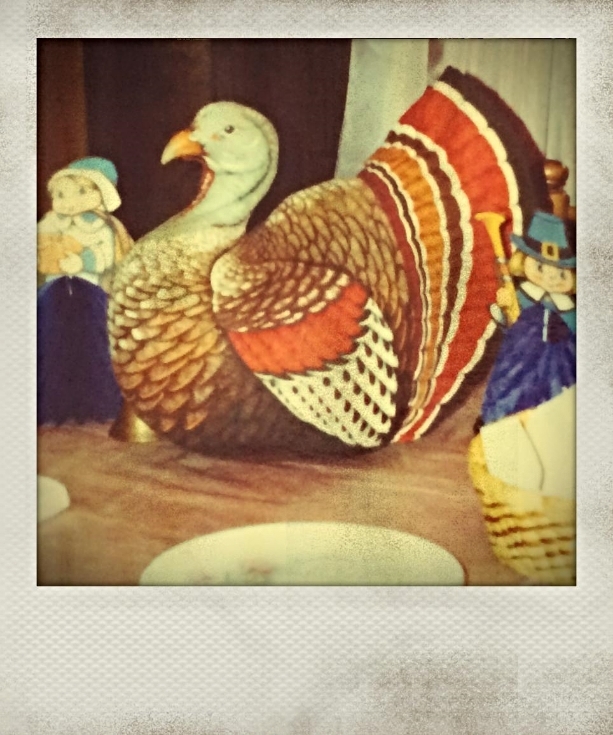 Thanksgiving circa 1990 - My family dynamic has greatly changed since then, but I am thankful for these memories and for the pictures that keep them alive. Everything in our lives is non-stop, rushed and full. Full of everything and anything all at once. Our average attention span is 8 seconds – 8 SECONDS!! By now, I’ve probably lost 90% of the people who were reading this. In less than 8 seconds I can think of a handful of things I am thankful for: My family, my friends, my health and a roof over my head. Just this morning I was thinking how thankful I was for a hot shower. Think about it. A hot shower on a cold morning, or any morning for that matter, to some it’s a luxury. I know it sounds a bit hokey, hopefully not preachy, but I just want to get the point across about appreciating your every day. 2010: Our first Thanksgiving in our new home. At first I was sad, it was just the two of us (my husband and I) and I was really missing our families, but again, thankful we had each other and the feast that was actually edible. My brother suggests in his comment that we’re too busy to appreciate the mundane. I guess if it’s not packaged in a humorous 30 second Buzzfeed clip, it’s not relevant to our lives anymore. I would like to see that change, little by little. I find myself going days without being thankful for a multitude of things, but when I do it changes my focus and perspective for the better. So I hope this Thanksgiving wherever you may be, around the table, with Grandma, watching football or sleeping in, that you take a second to look around you and smile. You do have a lot to be thankful for and you have 365 more days to celebrate it.